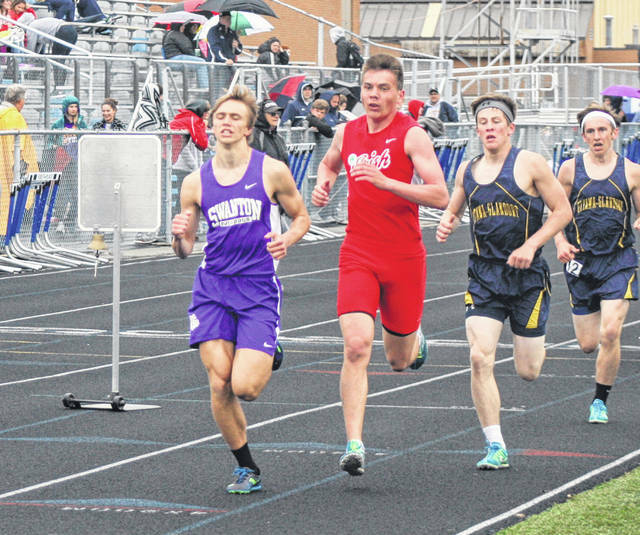 Swanton’s Dylan Gilsdorf, far left, in the 1600 meter run at the Division II district meet last season. He is back for his senior season in 2019. 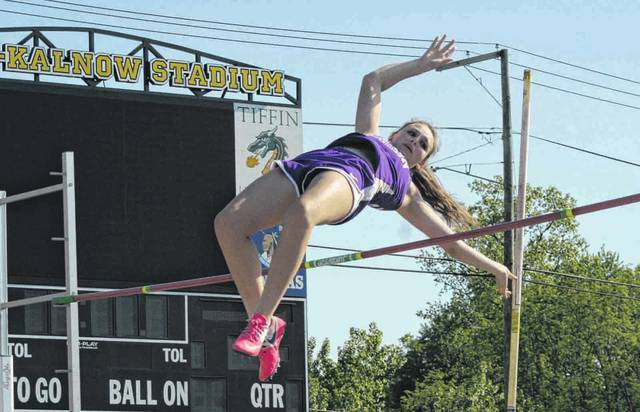 Hannah Grabke of Swanton clears the bar in the pole vault at the regional meet last season. The senior is back as the school’s record holder in the pole vault. Brett Bettinger returns for his senior season. The Swanton girls track and field team loses several top level performers from last year’s squad, but the cupboard is not completely bare. The 2018 team was regional runner-up then finished ninth in the state with a state champion and two other placements. One lost to graduation is Julia Smith, who is now competing at the University of Toledo. Smith’s prolific high school career in the high jump concluded with a state championship. She placed at state four times in the event. Also gone is Sidney Taylor, who just completed her freshman season playing basketball at Holy Cross College in Indiana. Taylor placed third in the state in the discus and also won a league title in the shot put. Sprinter Haley Nelson also graduated and is continuing her track and field career at Division II Davenport University. Nelson was hampered by an injury her season season, but was part of the 400 meter relay team that took fifth at state. She also won multiple league titles during her junior season. Ally Hendricks, another quality sprinter, is also gone. She was part of the league runner-up 400m relay team in 2018 and the league champion 400m relay team in 2017 and placed in the long jump at the NWOAL meet. Senior Bridget Harlett won the NWOAL title in the 100m last season and was part of the 400m relay that was fifth in Ohio. However, Harlett suffered an injury during the basketball season, and will not be able to compete. “We are young, but experienced in sprints, throws, and hurdles and will rely on our returning letter winners to guide us in hopes of competing well and getting better as the season progresses,” said first-year coach Walt Steele. Bobbie and Brooke Oberle are two of the key returning letter winners for the Bulldogs. They were both part of the state placing 400m relay team. Brooke was also third in the 200 meter dash and fourth in the 100 meter dash at the league meet. Bobbie did not compete at the league meet but won a district title in the 100m hurdles and was a regional placer. Senior Hannah Grabke also returns for the Dogs. She was league runner-up, a regional placer, and set the school record in the pole vault. Grace Oakes returns in the throws after qualifying for the regional meet in discus as a sophomore. Sophomore Jasmin Kenzie is also back after a third place finish in the high jump at last year’s league meet. Sophomore Sammi Taylor returns in the shot put and discus. Swanton will also look to several promising newcomers to have an impact. They include freshman Audrey Szalapski in long jump and sprints, freshman Brooke Dockery in middle distance, freshman Jayden Hendricks in sprints and hurdles, freshman Macy Pawlowicz in sprints, freshman Rheannah Kesler in sprints and freshman Trista Eitniear in shot put and discus. The Bulldog boys have six letter winners back as they look to improve on last season’s sixth place finish at the league meet. Senior Dylan Gilsdorf is among the top returnees for coach Ryan Borer, after a 2018 season that saw him finish as league runner-up in the high jump and qualify for the regional tournament in that event, as well as the 1600 meter run. Also back is senior Brett Bettinger, who placed in the top five at the league meet in both the 1600m and 3200m. Sophomore Blake Szalapski returns after placing third at the league meet in the long jump as a freshman. Dean Croskey returns in the throwing events for his senior year. He was seventh in the shot at the NWOAL meet. Senior Donovan Avalos is back in middle distance following a season that saw him place as part of two relays at the league meet. Senior Xavier Williams is the final returning letter winner, having qualified for the 100m final at the league meet as a junior. Lost to graduation is Anthony Howard. 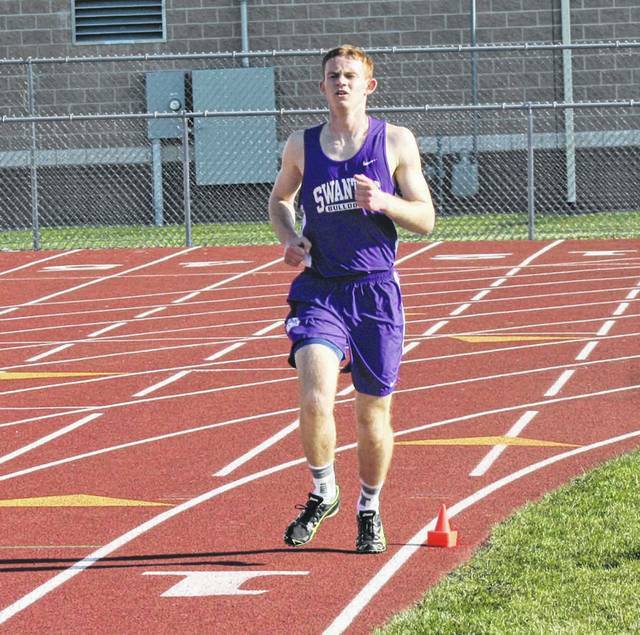 He had a stellar senior season in which he won the 800 meter title at the NWOAL meet, finished second at the regional meet, finished ninth at state, and set a school record. Also gone are Isaac Thomas and Josh Kohlhofer. Key newcomers to watch include Randy Slink in the high jump and Bryce Marvin in the throws. “We are experienced in the distance events and high jump and will rely on our returning lettermen to guide us in hopes of competing well and getting better as the season progresses,” said coach Ryan Borer, who is in his sixth season. The Bulldogs open the season on April 2 against Eastwood.